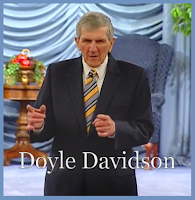 Join Doyle Davidson, and Kathie Davidson on set today as Doyle shares several testimonies how Jesus proved that He was with him. Kathie speaks about sin and says you cannot wait until you are all cleaned up; but instead go to Jesus, and He will get you out of that sin. May 2nd 2015: Announced shortwave will be canceled. 9/24/2016 - Would A Man Mock God? 9/20/2016 - Have You Considered My Servant Job?